TimeformUS Chief Figuremaker Craig Milkowski flagged this as one of the Breeders’ Cup races most likely to feature a pace meltdown. Indeed, there is plenty of speed signed on for this race. The front-running types will all be looking to get forward early position before heading into the clubhouse turn, which comes up very quickly going a mile at Del Mar. The Pace Projector is predicting that Sharp Azteca (#3) will be the quickest of them all early, but he figures to have plenty of runners chasing him. In addition to his chief rival Mor Spirit, horses like Giant Expectations, Cupid, Accelerate, and Battle of Midway all figure to be in hot pursuit of the early leaders. The only true closers in the race are Awesome Slew (#5) and Practical Joke (#10), who would both benefit from taxing early fractions. #1, IRON FIST (12-1): This gray ridgling hasn’t been facing top company in recent starts, and was trounced by Mor Spirit when they met back in May at Lone Star Park. He did show the flexibility to close from off the pace in the West Virginia Governor’s two back, which bodes well for his chances to pick up a minor award here. However, that seems like his ceiling. #2, GIANT EXPECTATIONS (12-1): He won a weak edition of the Grade 2 Pat O’Brien back in August, and his other speed figures are just too slow to make him much of a factor here. He’s potentially a pace presence as he stretches out from six furlongs to a mile, but I doubt he’s around in the lane. #3, SHARP AZTECA (9-2): This admirable son of Freud has done nothing wrong during the past year. The best part about Sharp Azteca is that he doesn’t need to carry his racetrack around with him. He finished a game second in the Malibu in his only prior trip to California, and he was undoubtedly best when finishing a gallant third in the Godolphin Mile in Dubai this winter. If he runs his race, the only horse that Sharp Azteca really has to fear is Mor Spirit, who destroyed him in the Met Mile. However, Sharp Azteca has gotten better since then and Mor Spirit has spent all those months on the sidelines. I love that this runner’s connections got a two-turn win under his belt two back in the Monmouth Cup, going one-sixteenth of a mile farther than he’ll be asked to travel this time. The pace of that race was fairly moderate, but he showed no signs of stopping through the lane. The early pace is predicted to be fast, but he’s a horse that can go fast and still finish. He’s perfectly posted towards the inside, and can control this race on the front end if he breaks cleanly. He won’t be a huge price, but he is the most likely winner. #4, GATO DEL ORO (30-1): This longshot barely held off Giant Expectations going this distance at Del Mar, and he has been soundly defeated by Battle of Midway in two subsequent starts. He’s a pace presence at best. #5, AWESOME SLEW (12-1): Awesome Slew may not have the flashiest resume, but he has shown up with pretty solid efforts in just about every start this season. 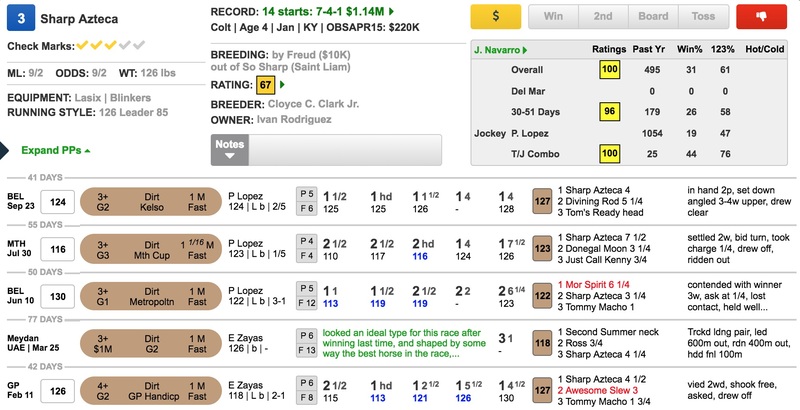 He did not get favorable pace setups in the Gulfstream Park Handicap or Met Mile, which both featured paces that were color-coded blue (indicating slow fractions) in TimeformUS PPs. He ran well to close for second in the Forego in a race that Drefong dominated on the front end, and he then responded well when stretched out to today’s distance against an inferior group at Churchill Downs last time. While he’s been a one-turn specialist this year, he did handle two turns well enough as a three-year-old, logging an impressive win in the Smarty Jones at Parx before finishing a respectable fifth against the best colts of his generation in the Pennsylvania Derby. The one-turn races have altered his running style and intensified his late kick. This will be his first test stretching back out to two turns while using his preferred closing tactics. Based on his overall body of work, it’s quite likely that this two-turn mile will be right up his alley. If a fast pace does indeed materialize, he’s the closer that I want, and he’s likely to go off at a bigger price than Practical Joke. That expected value makes him my top selection. #6, MOR SPIRIT (3-1): If he repeats his Met Mile, this race will be over at the quarter pole. Bob Baffert has conceded that the race took something out of this horse, which necessitated this lengthy layoff. However, Baffert does have decent numbers in this situation. Over the past five years, he is 5 for 13 ($2.61 ROI) off 100-200 day layoffs in graded stakes on the dirt. If Mor Spirit wins this race, he will do it off workouts – and those workouts may be telling. He’s a notoriously poor work horse in the mornings. Yet if you go back and watch his final drill prior to the Met Mile, he looked like a completely different animal, aggressively speeding through a half mile in 46 and change while barely getting asked by his rider. In essence, he tipped his hand prior to that performance. We have not seen that kind of willfulness in his recent morning work, all of which, oddly, has been out of the gate. He’s needed to be ridden early to reach top speed each time, and his exercise riders have had to motivate him around the far turn and into the stretch to keep him going. I’m concerned that we may not be getting the same version of Mor Spirit that we saw at Belmont in the spring, and if that’s the case, he could be in trouble. At a short price, and perhaps as the favorite, I want to try and beat him. #7, CUPID (8-1): Where did Cupid’s Gold Cup effort come from? This horse just has not looked nearly as strong in two subsequent starts, recording much slower speed figures on each occasion. He got the job done going this distance at Del Mar two back, but appeared to become unfocused in the stretch, nearly blowing an assured victory as he shortened stride approaching the wire. Unless he regains the top form we saw back in the springtime, a minor award may be his best hope. #8, ACCELERATE (7-2): This horse has been totally transformed by the addition of blinkers two back. Ever since they were added, he’s shown none of the gate issues or sluggishness that had plagued him in a few prior starts. He loves Del Mar, his only loss over this track having come at the hands of Collected and Arrogate in the Pacific Classic. The speed figures that he earned in that race, and in his preceding romp in the San Diego Handicap, place him on the same upper tier occupied by race favorites Sharp Azteca and Mor Spirit. He’s coming off a brief layoff ahead of this race, but John Sadler has decent enough statistics with horses coming back in two or three months. Of greater concern is the outside post position, especially given his new aggressive running style. He has to avoid working out a wide trip while not giving up too much ground to the early leaders. The early pace of this race will almost certainly be faster than what he’s seen in recent starts, so he may be forced to revert to more patient early tactics. There are some minor hurdles, but as long as he runs his race, he figures to be part of the trifecta. #9, BATTLE OF MIDWAY (10-1): This 3-year-old seemed to have really turned a corner at Del Mar two back, but followed that up with a disappointing loss in the Oklahoma Derby. 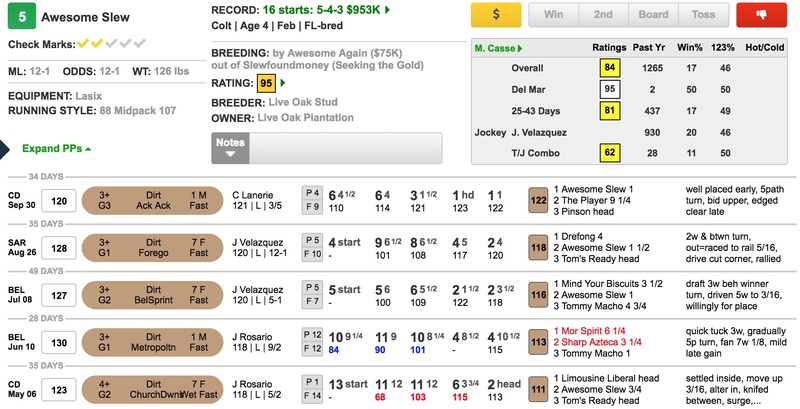 It’s possible that he just really wants to go a mile, as he made the lead in midstretch and just couldn’t sustain his bid going nine furlongs last time. I think he’s well placed, but he just happens to be contesting an unusually tough renewal of this race. There’s talent here, but I have trouble envisioning him working out a winning trip from this post position, given his pace-pressing style. #10, PRACTICAL JOKE (6-1): Practical Joke is one of the coolest horses in training, and is so admirable for his flexibility. He just shows up on every occasion, no matter the distance or the circumstances. His trainer, Chad Brown, is one of the best in the game, but he is 0 for 9 (with only two hitting the board) in Southern California dirt races over the past five years. Many of those were longer prices, but it’s still somewhat of a concern. It’s also worth pointing out that this colt was on the best part of the track when getting a dream trip to record his biggest win in the Grade 1 H. Allen Jerkens last time. He would require a similarly fast effort to contend for a top three placing in here. Can he produce such an effort from this outside post position while stretching out? A mile is probably his best distance, but I would strongly prefer that this race were around one turn. He’s undefeated in five attempts around one turn, but is 0 for 5 in two-turn races. Practical Joke is an easy colt to root for, but I’m afraid that the negatives outweigh the positives this time.